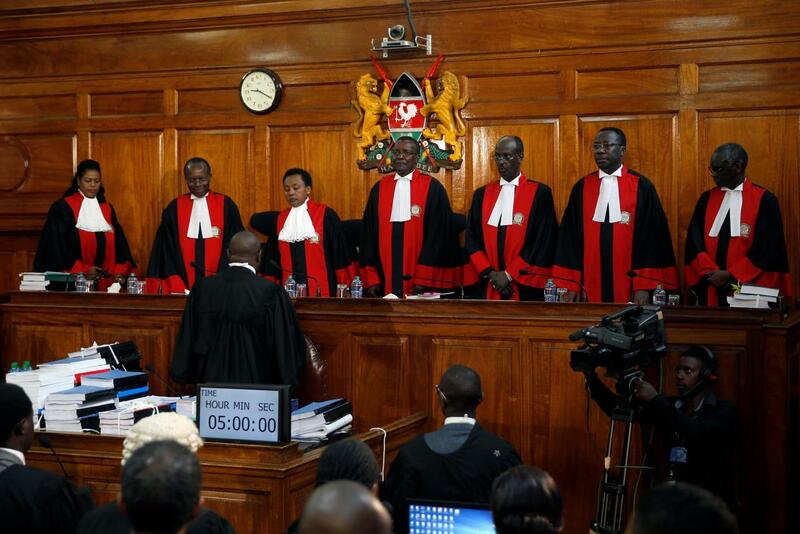 Home OPINION How the Supreme Court judgment may lead to a NUSU-MKATE government. How the Supreme Court judgment may lead to a NUSU-MKATE government. In its September 1 ruling, the Supreme Court cited negligence or refusal by the Independent Electoral and Boundaries Commission (IEBC) to conduct the election according to the law, which it indicated harboured illegalities. Justice Maraga then asked for 21 days to present details as to why it nullified the presidential results of August 8 elections, a matter that is expected between today and Thursday this week. The outcome of this ruling could either make way smooth for IEBC to conduct the election without having to bow to any pressure or play into the hands of NASA that has made a raft of preconditions to the electoral body. If by any chance its detailed ruling points out criminal culpability of any specific high-ranking officers, this will definitely plunge IEBC into a crisis caused by likely resignations and prosecutions, thus crippling the agency’s ability to deliver an election within the non-negotiable tight timeline. It will simply impair IEBC’s capability to hold fresh elections contemplated in Article 140(3) of the Constitution within the requisite period of 60 days. According to election laws, none of the other commissioners are qualified to be chairman of the agency. So, if the court finds either IEBC Chairman Wafula Chebukati, other commissioners or Chief Executive Ezra Chiloba breached the law, DPP would start criminal investigations and it could easily mean there would be no election in the next six months as the country cannot hold an election without IEBC chairman who takes that duration to recruit. The lesser damaging ruling would be for the court to exonerate any of the senior staff from blame and may be finding IEBC ground staff such as returning and presiding officers solely responsible for the cited mistakes. This would leave the national office free to deal with the specific culprits and do replacements to conduct the election. The judges may decide that the annulment may have been based on minor and scattered mistakes, many which may not have been intentional. For instance, many returning officers accused of sending incomplete Forms 34A and 34B, likely made mistakes during transmission using the Kiems which they could not correct since the gadget is designed to relay only once. When they made corrections, they had to use other means, including their phones to relay, which may be seen as illegal, but with a genuine intention to transmit genuine results. Essentially, such a finding would mean the election proceeds as planned on October 17, or any other of two dates (October 24 or 31). Another scenario would be to find the illegalities committed, by their low magnitude, do not warrant action against IEBC and to leave it free to run the fresh poll. That notwithstanding, the Supreme Court must therefore ensure it does not become the means by which unconstitutional change of government, with its attendant instability, chaos and violence, is perpetrated in this country. To achieve this, it must provide an iron clad reasoned judgment that will leash any attempts at subverting the constitutional requirement that a fresh election must ensue within 60 days of the annulment of a first election. Failure on its part will cast it as an agent of those intent on reversing the advances made in Kenya’s democratic journey so far, and will invite upon itself global reprobation and history’s severe judgment. Legal experts have warned that the country maybe staring at another coalition government following fresh unattainable demands by NASA leaders which may end up throwing the country into a constitutional crisis that could demand for another power-sharing deal between the Jubilee and NASA. The NASA presidential flagbearer Raila Odinga is on record saying that he will not participate in a fresh poll if the current IEBC commissioners remain in office and has further warned that there will be no election in this country if their demands are not met in totality. The consequences of the Supreme Court September 1 ruling which faulted IEBC in the election are dire than what appears at face value. Any action by the opposition to have senior IEBC staff replaced will be detrimental to the electoral process as new appointments cannot be possible within the limited time. If any of the senior Chiloba or any of the commissioners bows to pressure and resign, this will lead to a vacuum in the electoral body. That would mean more time would be required to vet and recruit a new team which would take a lot of time because of the NASA-Jubilee wars. Should this happen, the country would be at the mercy of politicians and the most likely way of sorting matters out would be brokering a power sharing arrangement between the political rivals.